I ran across some wonderful material today in Michael Casey's Living in the Truth: Saint Benedict's Teaching on Humility. Well, it's wonderfully true, but it's not wonderfully enjoyable. The point Casey makes in chapter four is that Benedict's doctrine of humility places our comfort and prosperity at odds with our humility. Here is how it works. Humility is in large part a dependent openness toward God. That is, we see God as the answer to our needs, and we are receptive to any and all of his grace. The problem is that when times are good, we drift off into a God-forgetting slumber. This is the gist of Moses' message in the book of Deuteronomy. He teaches something to the effect of: "When times are good, you will forget God. And then he will discipline you, and when times are tough again, you will remember him." It is our nature to define love in terms of behaviors. “Jesus left us with one command: to love one another. What must we do in order to fulfill this command?” That is our question. But it is a question doomed to frustration. In her book on the monastic fathers and mothers, To Pray & to Love, Roberta Bondi points out that in the deserts, people commonly came to the Abbas and Ammas, asking for a code of conduct to follow or some ascetic disciplines to practice. But the Christian virtues, love included, are not a matter of rules or spiritual disciplines. They cannot be externalized like this. Rather… “The virtues are Christian patterns of seeing, feeling, and understanding, as well as acting that affect everything we do and everything we are. They are the internal laws that make us who we are, as Christians, but also as human beings” (39). 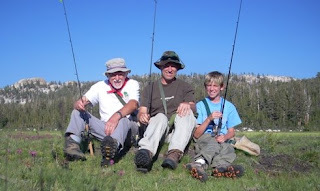 I just returned from a backpacking trip in the high Sierras with my dad and oldest son. We packed in an area near Fresno called the Dinkey Lakes Wilderness. Yes, the lakes were dinky, as in small. Most natural alpine lakes are. But the place is really named for a small dog named Dinkey who protected his master by attacking a charging grizzly bear, giving the man time enough to grap a rifle and kill the bear. Dinkey lost his life for his act of heroism, but he was such an inspiration that an entire Sierra wilderness was named after him.